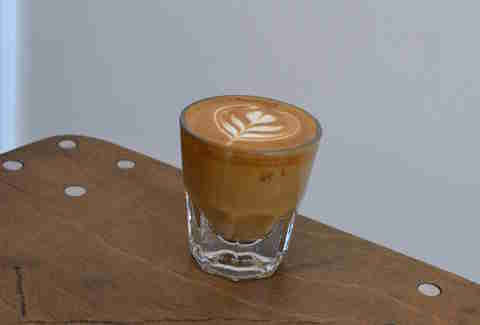 LA’s coffee scene is booooooooooooooming with homegrown coffee roasters and café owners being joined by an influx of high-profile bean pushers from coffee meccas like the Bay Area, Portland, and Chicago. And while driving all over LA trying the latest and greatest in coffee-age sounds fun and all, what you REALLY want is to drive to the absolute best coffee shop in whatever neighborhood you’ll actually be in anyway. 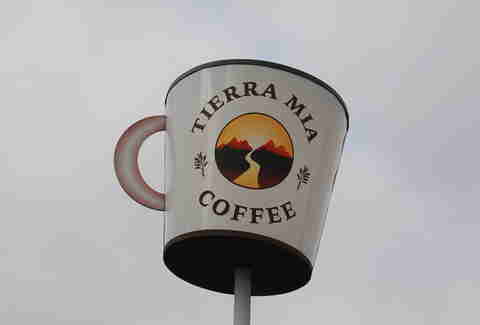 SGV’s best coffee shop has both the requisite reclaimed wood/mural that riffs on “American Gothic” (complete drawings of the peacocks at the nearby LA botanical gardens) AND a fluid roster of roasters. This shop always puts quality at a premium, whether it’s the coffee program or pastry lineup (which could include Sugarbloom’s killer kimchi Spam croissants, or Donut Snob’s magical rings). 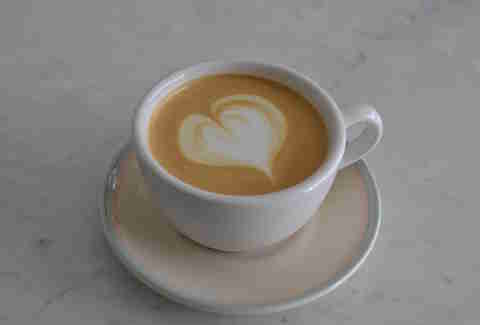 Mark Wain and Gary Chau started their caffeinated efforts in nearby Santa Monica, with latte artistry as a lynchpin, and have since expanded to three Westside cafes. Brentwood houses their most casual outpost, with outdoor tables in front of what was once Dutton's Books, back when bookstores were still a thing (RIP, guys). Tyler King’s growing chain (you might remember it from the Instagram-friendly tile everyone keeps... Instagramming) now has a Valley location where it's rotating West Coast roasters and serving all its cups with a Bennigan’s-level amount of flair. Most importantly though: this is the only branch of Coffee Commissary that has Free Range fried chicken sandwiches on the regular. Second most important though: the breakfast burritos and house-baked pastries are also impressive. 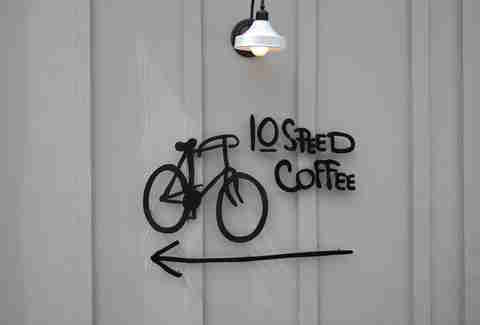 The West Valley doesn’t get much love, but Calabasas, which stands at the gateway to the Santa Monica Mountains, has more than enough to share thanks to 10 Speed Coffee. This coffee bar, which expanded from Hood River, Oregon and occupies the back of Pedalers Fork restaurant, uses premium equipment to roast coffee literally right upstairs. Coolest part though? The back patio faces a creek and features a bike shop, in case you want to get a tune-up while fueling up. Endorffeine’s minimalist space features a stainless steel-topped Modbar with built-in equipment, Heart Coffee, and a commitment to endorphins and caffeine (Endorffeine!). Menu-wise its got standard espresso fare, plus pour-over and specialty lattes like makrut lime malbec, vanilla pandan, and palm sugar whiskey with Willett rye reduction, ensuring it can solve your caffeine and alcohol withdrawals AT THE SAME TIME. Considering Yeekai Lim earned his bones with pop-up coffee bars around the city, it’s nice to see a fully realized take on his vision. 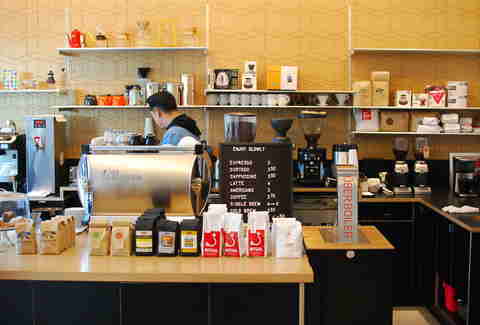 The barista in charge is also an architect, and he’s built a beautiful indoor-outdoor space amidst Culver City’s art galleries, complete with a wise owl logo. Some days, Cog might have five different roasters in its countertop lineup, and it knows what to do with each and every bean. Even in this group, there’s something about Kyle Glanville and Charles Babinski’s open-air Grand Central Market stall that stands out. 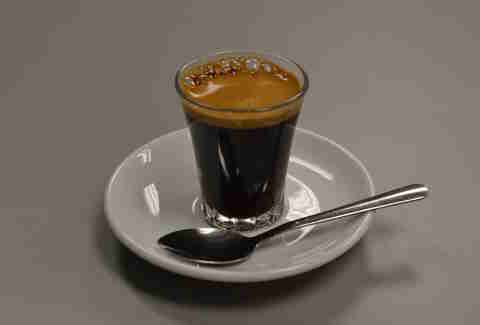 Sure, the award-winning baristas take an exacting approach, sparing no gram when pulling espresso shots or brewing cold brew. But the duo also has fun. Just look at their take on the dark & stormy, made with house ginger beer, or the powerhouse shake made with fresh-pulled espresso, ground espresso, and silky scoops of ice cream from GCM neighbor McConnell’s. 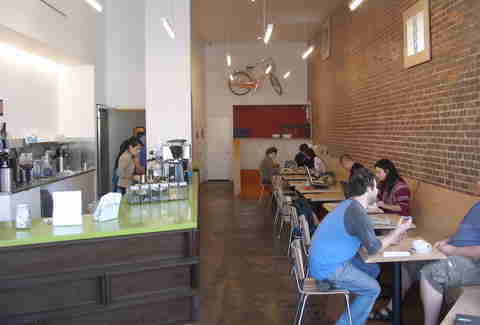 This strip-mall space features wood banquette seating, communal tables, vivid turquoise chairs, and art-lined walls -- along with a yellow La Marzocco espresso machine and glass pour-over set-up that produces exercises in coffee-cup perfection (typically from a local roaster like Demitasse or Peri). Found drops conventional espresso and coffee drinks, along with a bourbon vanilla Latte featuring syrup made in-house with, uh, “fancy pants” vanilla. Tux yeah. 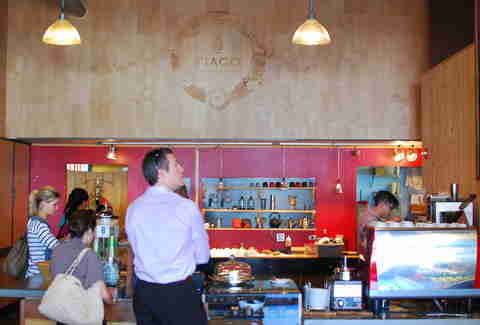 Bay Area darling Wrecking Ball Coffee Roasters is the main event in a space that’s quickly -- and unsurprisingly -- becoming a neighborhood hangout, thanks to hipster-friendly reclaimed wood, boxy stools at counters and tables, and a bright-red wall that casts a demonic glow on anybody that sits nearby. 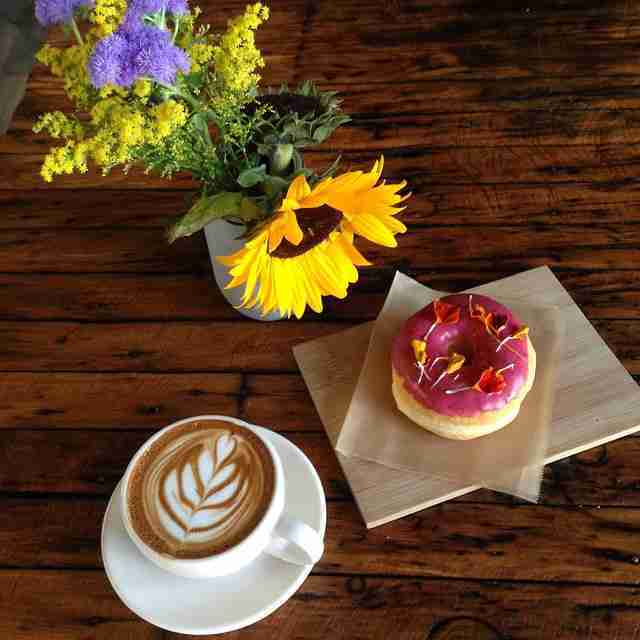 Woodcat also serves Sugarbloom pastries all week, plus serious donuts from Campfire Confections on weekends. Pier Ave is more of a playpen for fraternity post-grads, so Scapegoat -- which serves up Stumptown hot and cold brew on draft -- stands out even more than it would in other neighborhoods. It doesn’t have any seats, but the pier and beach are nearby and both serve as coffee-/Instagram-friendly backdrops. 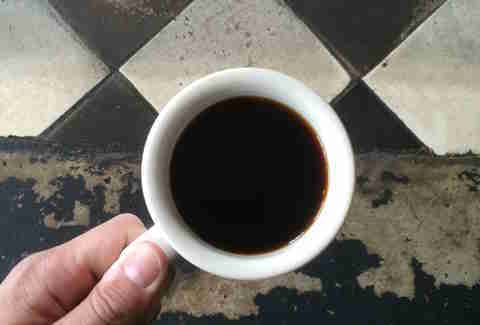 You’ll recognize the first specialty coffeehouse to hit Highland Park from its constant appearances on Maron, and Marc’s addiction to its Stumptown pours makes total sense. Also: parents will be happy to find a children’s play area in back, so kids can get loose while they load up on caffeine. Yes, this stretch of Hollywood Blvd is better known for flocks of tourists (since the Hollywood Walk of Fame is right outside Tiago’s door), but Santiago Garfunkel has somehow carved out a niche for specialty coffee, with a multi-roaster attack that means your favorite coffee might change from week to week, but you can always trust what lands in your cup. Korean coffee chains have been multiplying at a ridiculous clip in Koreatown, but none of them can match the quality level of Document Coffee Bar, which features a white façade and walls, communal wood tables and counters, and utilitarian chandeliers crafted from work buckets. 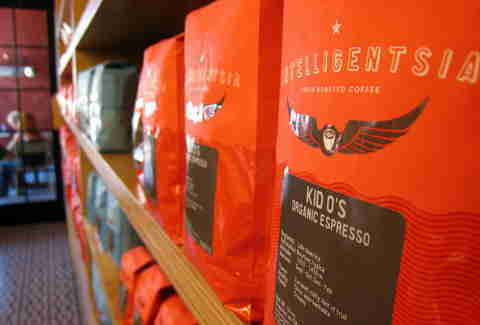 The bar features beans from multiple roasters, including Supersonic from Berkeley, PT’s from Topeka, and Temple from Sacramento. 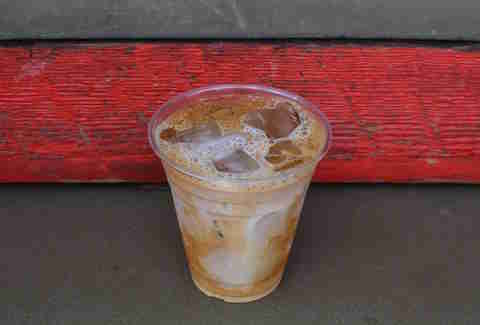 The espresso machine and Kyoto cold-brew towers work wonders, including the Document Cold, a signature coffee beverage that combines cold brew, chicory, milk, and Grade A maple syrup from Howrigan Family Farms. This similarly precise coffee bar from Misters G and B in Larchmont Village may be even more ambitious, with pastries and food made in-house, indoor seating, and a hand-painted astronaut who looks like he’s floating across the wall. Willing to risk a trip to the heart doctor? Consider the Full Nelson, a flight of coffee drinks named for a regular customer that includes an espresso, macchiato, cappuccino, and that phenomenal G&B shake. Lord Windsor roasts green coffee on a green Diedrich roaster in back that makes its way onto a menu that’s misleadingly simple, with espresso drinks prepared with precision, plus iced coffee and pour-over. Yes, it ALSO has Instagram-friendly tile floors, but in vintage black-and-white checkerboards instead of some nouveau chic pattern plucked from a design catalog. This multifaceted café has managed to stand out in Old Pasadena, a neighborhood that has seen a glut of coffee concepts in recent years. 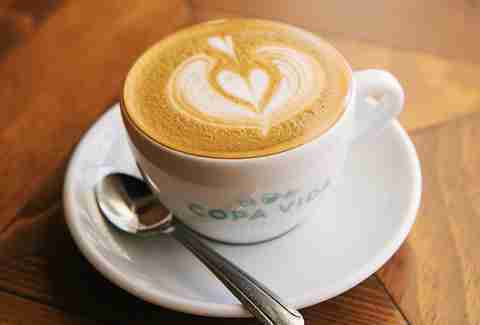 Three West Coast roasters normally find their way into Copa Vida’s grinders and brewers, and the shop also bakes in-house, which yields bread that helps to fuel killer sandwiches -- and plenty of coffee-friendly pastries. This corner spot, just two blocks from the beach, features Carrara marble and an antique clock that would make Flavor Flav jealous. An obviously strong coffee program complements the refined surroundings, including 49th Parallel coffee beans roasted in Vancouver and Kyoto-style towers that slowly drip masterful cold brew. 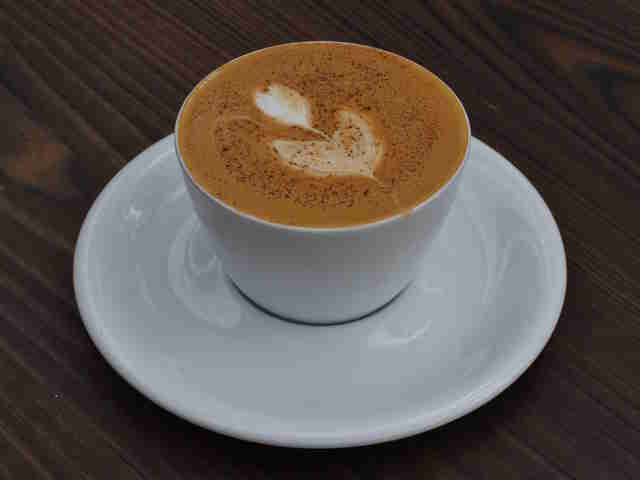 The dream team that opened this Sunset Junction coffee bar in 2007 has long since disbanded, but Intelligentsia’s first LA branch remains a juggernaut. 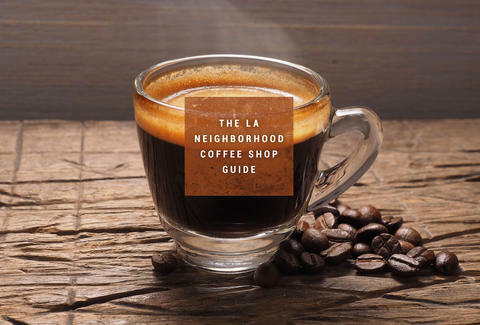 The coffee is roasted in nearby Glassell Park, quality remains good given the high volume, and the signature Angeleno beverage is as popular as ever, featuring a quadruple shot of espresso shaken with milk, agave, and ice. Happy sleeping! 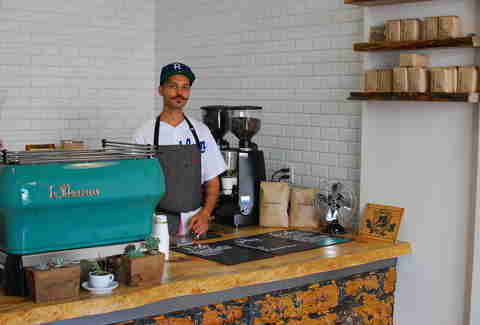 With eight LA locations in spots as far reaching as Huntington Park and Santa Fe Springs, founder Ulysses Romero 1) already dominates South LA specialty coffee, 2) has been expanding to central LA and the Bay Area, and 3) is slowly filling the gaps in between. For the LA branches, the chain roasts coffee in Pico Rivera and bakes in Huntington Park, and the shops crush it when it comes to infusing Latin flavors, whether it’s with a Mexican mocha espresso drink or a horchata latte cupcake. 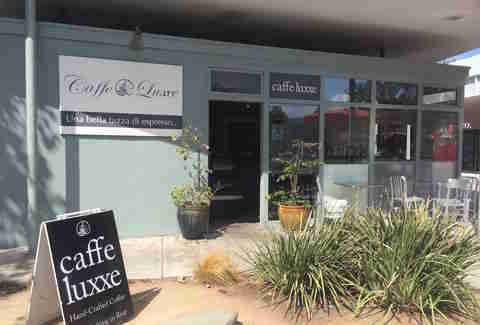 Since Studio City can’t live on sushi alone, two couples -- music producers from Australia -- opened this brick coffee kiosk with a red-framed window in a parking lot earlier this year. 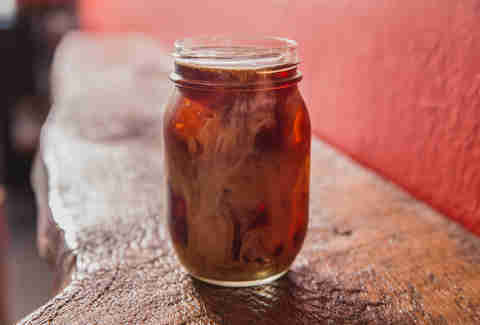 They more or less mirrored the Blue Bottle Coffee menu, including New Orleans cold brew that’s steeped with chicory for 16 hours and served on ice with a choice of milk. This quick-grab spot from a longtime vet is within shouting distance of Venice Beach’s drum circles, so caffeine up before... getting your pound on? Something like that. 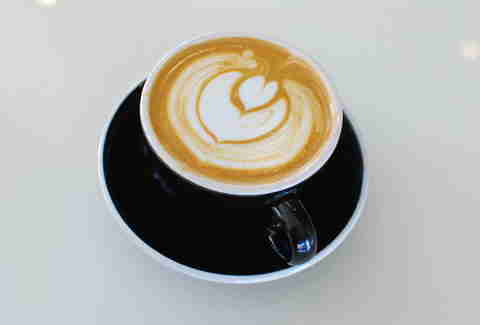 Four Barrel Coffee gets the star treatment here, and latte art is some of the city’s best. It also has a secret menu (!!! ), which you can find behind the framed photo of shop namesake Cesar Menotti, and features drinks like the Short Stack, a superlative bevvie loaded with espresso... and maple syrup. Santa Cruz-based co-founders Colby Barr and Ryan O’Donovan started their LA expansion of Verve in DTLA’s Fashion District, and that bar’s a beauty, but the concept stands out even more in West Hollywood. The space features fashionable wood chevron flooring, a copper bar, a plant-lined patio with colorful tile work, and a shiny silver Kees van der Westen espresso machine that looks like it might set off for outer space. It also has a new killer sig drink: a tres leches cappuccino made with a Juice Served Here blend of almond, hazelnut, and cashew milks plus coconut water. Joshua Lurie is the LA-based founder of Food GPS, a website that showcases the best-tasting food and drink in California. Follow him on Instagram and Twitter at @foodgps.